The D-Bag Daily: Chicken Soup for the Soul? 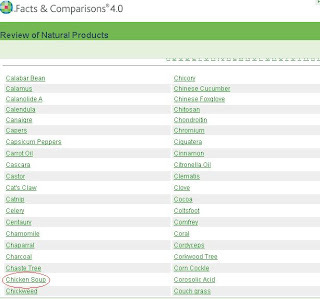 I had a slow night at work last night, so I started browsing the new Natural Products section on Facts & Comparisons. Look what I found! Yep, it's really there. Under dosing guidelines, it suggests administering by the bowlful. I kid you not!